FORMULA GUIDE Solid Coated & Solid Uncoated. The "must have" guides for designers, printers and color decision makers now with 84 brand-new colors! PLUS SERIES FORMULA GUIDES for selecting, specifying and matching solid PANTONE Colors feature 644 new colors included since 2010 - with 84 added just this year. The new colors for 2014 fill out our expansive palette with beautiful new Blushes and Pinks, and clean and vibrant new Blues, Greens and Violets. Graphic designers, pre-press professionals and printers now have a total of 1,761 color choices to unleash their passion and let their creativity soar! Also new this year are Artist Edition Covers. We selected an artwork from a member of our PANTONE CANVAS Portfolio Sharing community and segmented it to create seven new inspirational covers. Find out how to join PANTONE CANVAS. PANTONE is the only internationally recognized color communication system. You can specify PANTONE Colors with confidence even if your manufacturing is half a world away. All new colors have been specially formulated to print using a uniform ink film thickness, making them easily matched on press. Ink formulations are provided to aid printers in mixing colors. Includes color index, lighting evaluation tool and software to update your design applications with the latest colors. Set of two guides, coated and uncoated, comes in a limited-edition gift box. 1,761 solid PANTONE Colors, including 560 new market-ready hues. PANTONE COLOR MANAGER Software for updating PANTONE Colors in popular design applications. Ink mixing formulas in parts. Each color identified with a distinct PANTONE Number or name. Colors bleed for ease and accuracy in checking colors. Includes ColorChecker® Lighting Indicator to aid in lighting evaluation. Broad selection of market-driven colors, for practically unlimited creativity. Substrate paper stock matches popular print specifications. Compatible with todays digital workflows colors easily updated in leading design applications. All new colors are printed using a uniform ink film thickness making them easily matched on press. Eliminates guesswork in color selection and verification. Easy to communicate colors by distinct number or name. Shows the effect of coated and uncoated stocks on each color. Included lighting indicator tool determines if lighting conditions are suitable for accurate color selection and matching. PANTONE Colors are internationally recognized for color communication and are globally available. System supported by worldwide network of PANTONE Licensees. Sellers: Add a FREE map to your listings. 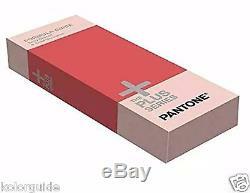 The item "Pantone FORMULA GUIDE Solid Coated & Solid Uncoated, Last Edition" is in sale since Monday, March 10, 2014. This item is in the category "Business & Industrial\Printing & Graphic Arts\Printing & Graphic Essentials\Color Guides & Pantone". The seller is "kolorguide" and is located in Fort Lauderdale, Florida. This item can be shipped worldwide.